In 1930 a new housing estate was started on the east side of the main railway line through Cambridge. The Vicar of St Paul’s, Mr Ainsley, had a vision for ministering to the people on this new estate which was in his parish but cut off by the railway. He approached the Master and Fellows of Jesus College, who gave a parcel of land large enough to build a church in the proposed Suez Road. They decided to start with a “Mission Hall”. Money at this time was not easy to find; the Vicar prayed and wrote to friends and parishioners. Eventually a benefactor was found: Mrs E.M. Rowcroft, who was a supporter of the Church Pastoral Aid Society. She offered sufficient funds for the work. The “Shoebox”, just before the construction of St Martin’s started. The Hall was built in 1932, and an Evening Service, Sunday School and Women’s Fellowship began. The uninspiring rectangular hall was nicknamed the “Shoebox”! After the Second World War in 1945 a fund was opened, and the congregation made donations towards a proper church building. Around 1950 a Nissen hut was purchased to enable the flourishing Sunday School to grow. An architect was engaged and plans were drawn up, but they were rejected because they didn’t look like a church but more like a shoebox! 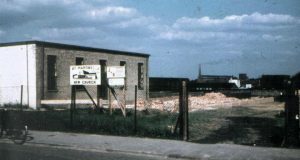 In April 1956 St Martin’s became a Conventional District, adding small parts of the parishes of St Andrew’s Cherry Hinton and St John’s to the part of St Paul’s beyond the railway. The Rev. Peter Barratt was appointed as the first Minister of the new district, and took up his duties in July 1958. 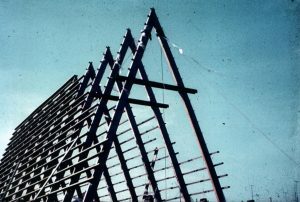 A new architect was appointed, who submitted the plans he had already drawn up for another church, built in the Wirral; they were accepted and work began in April 1960. Parts of the new building were in use from May 1961, and it was consecrated by the Bishop of Ely in a grand ceremony on 7th October 1961. The following year the Vicarage was completed next to the church, and the Barratts moved into the parish. Peter Phenna leading a children’s mission. Peter and Ruth Barratt moved on in October 1968 and he was succeeded by the Rev. Peter Phenna, a curate from All Souls Church, Langham Place, in London. Under his leadership the church extended its ministry to the elderly and the less fortunate, both within the parish and outside. With a background in marketing he knew how to raise the parish’s profile. An over 60’s club started, and was followed in 1972 by a Day Centre for the elderly, an innovation in those days. Lunch was provided 6 days a week; people were collected first in cars and later in a purpose-built ambulance. 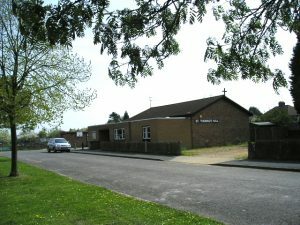 An extension was added in 1972 at the east end of the church to provide a lounge area for the Day Care Centre. One-Two-Eight Suez Road was started as a home for adults with learning difficulties. Romsey Mill was set up with other churches as a youth and community centre on Mill Road. In 1980 St Thomas’s Hall, in Ancaster Way, was built to reach the area of the parish east of Perne Road, and part of the burgeoning St Martin’s congregation was moved to establish it and fill the hall. Peter Phenna was succeeded in 1986 by Rev. Martyn Smith, who emphasised the healing work of the Holy Spirit. He left in 1989 to head up the work of Vineyard Ministries in the Manchester area. He was followed in September 1989 by Rev. David Armstrong, formerly a Presbyterian minister in Northern Ireland, who had left Ireland under threat of death from extremists who opposed his attempts at unity across the sectarian divide. He did much pastoral visiting in the streets immediately surrounding the church building and strengthened the links between the church and the local community. During this time he continued his unique ministry of reconciliation amongst the troubled groups in Northern Ireland, for which he and his wife June later received the Irish Peace Prize, and he was eventually rewarded with a cessation of hostilities. David Armstrong moved on in September 2000 to become Rector of the Carrigaline Union of parishes in the Diocese of Cork. He was succeeded by Rev. Stephen Leeke in September 2001, a “Cambridge lad” with many local links, and with family living in the parish. 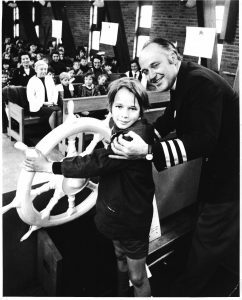 During his time, the “Care in the Community” aspects of our ministry (in some ways pioneered by St Martin’s and similar charities) have continued and developed. In 2003 the management of One-Two-Eight Suez Road was transferred to a bigger charity, and the church continues to provide pastoral support. Romsey Mill grew from a “one-man operation” to a large charity with over 40 employees, and Stephen was one of the trustees overseeing its period of major development. Stephen was also a Governor of the new Ridgefield Primary School, founded in the parish in 2002. When he retired as a governor (and regular visitor) after 12 years, the school library was named after him. While at St Martin’s, Stephen was made an honorary Canon of Ely in recognition of his service within the diocese. However, he derived more pleasure from seeing youngsters from the church youth group growing up to become missionaries serving God overseas – and curates and theological students, whom St Martin’s and St Thomas’s had helped to train, taking on leadership responsibilities in the Church of England. Stephen retired from office in 2015. He and Margaret have retired to Ely. Johannes Roth was licensed as priest in charge on 9th September 2016.